Okay, here it is, the Lake Trail at Radnor Lake. How can there be a better trail? Abundant wildflowers, a bird sanctuary, picturesque views of the lake and surrounding hills, and a flat, well groomed trail make it one of Nashville's premier trails. 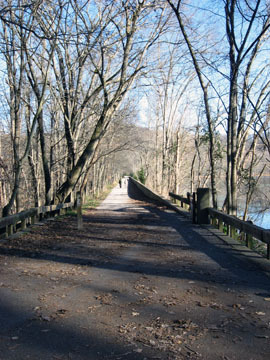 For an easy loop of Radnor Lake, leave the Visitor Center on the west side and hike the Spillway Trail a quarter of a mile up the gentle hill toward the dam. The trail stays to the left side of the spillway outlet as it winds up a manicured trail. There is a great overlook of the outlet creek located very close to the Visitors Center. At the crest of the hill the Lake Trail begins (continue straight ahead.) The Dam Trail enters from the south (right.) This road crosses the spillway and continues across the entire dam. Beautiful views make it worth the short detour to cross the bridge of the spillway to the northwest corner of the Lake. After leaving the dam, it is 0.3 miles to a lake overlook with benches. 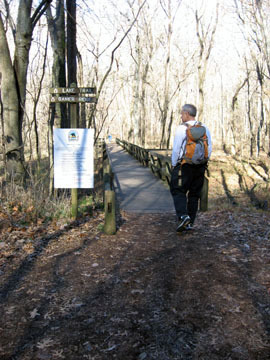 The trail leaves the lakeshore and heads northeast, another 0.3 miles to a long, sturdy bridge. After crossing the bridge, the trail heads almost due south .10 miles to the first (northern) junction with the Ganier Ridge Trail on the left. Glimpses of the lake can be seen as the trail continues south around the east side. A side trail to the left goes to a bench before it returns to the main trail. Then, after .40 miles the trail reaches a junction with the second (southern) leg of the Ganier Ridge Trail. From the trail junction it is .20 miles to Otter Creek Road, the East Trailhead for the Lake Trail. The last 500 feet of the trail follows a boardwalk crossing the marsh. At Otter Creek Road a left turn takes you to the East Parking Area and a right (west) returns to the Visitor Center. To hike the loop, turn right and walk Otter Creek Road .80 miles to the Dam Trail. Turn right at the Dam Trail and cross the dam where you will find several good view points along the way. The old Park Office Building is on the left before the Spillway. It has been used for educational programs, housing Park employees, and as an office. A bridge crosses the Spillway. The Dam Trail is a total of .2 miles long. To return to the West Parking Area and Visitors Center, turn left after crossing the Spillway and follow the Spillway Trail for .25 miles.